The Municipality of Machin is made up of 3 communities all located on the beautiful Eagle Lake. 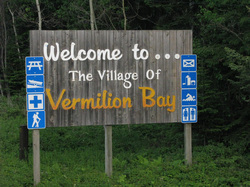 Eagle River, Minnitaki, and Vermilion Bay are all located in the heart of Sunset Country on the Trans Canada Highway, the population is about 1200 people. Tourism, forestry and mining are the main industries supporting these communities. There are excellent community services available, such as shopping, ice arena, recreation center, senior citizens activities, 2 public schools, provincial park, a volunteer fire department, public beaches, cross-country ski trails, airport and much, much more!